CAN Ethernet Gateway enables CAN networks to integrate with the Internet / Ethernet. Supports operating temperatures between -25 to 75°C. Internet communications using TCP/IP is increasing in the industrial sector. Using Ethernet for industrial networks is a good idea because the required cabling is already installed. The CAN-Ethernet Gateway from ICP DAS is a solution that enables CAN networks to be coupled together over the Internet via Ethernet, creating an environment where monitoring and control is possible. 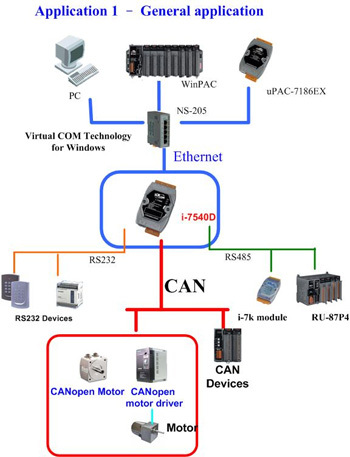 The CAN-Ethernet Gateway controls networked communications and creates a transparent CAN-based application interface. The device supports a transparent, protocol-independent transfer of the CAN messages, thus allowing its implementation into a wide range of possible applications. Furthermore, the CAN-Ethernet Gateway can be used with various higher layer CAN protocols (e.g. 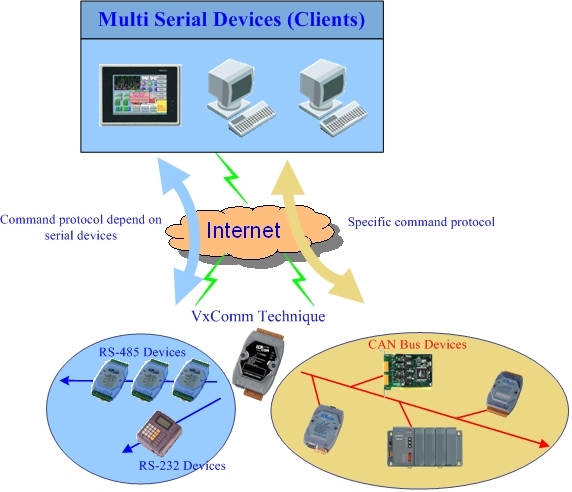 CANopen, DeviceNet or other proprietary protocols). 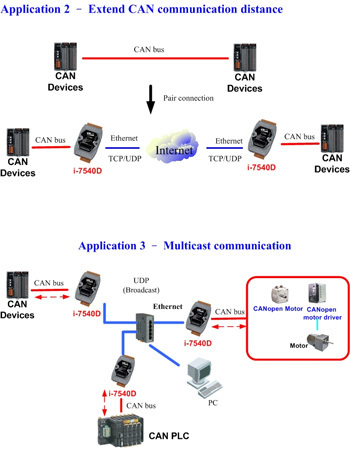 The following figure shows the application architecture for the CAN-Ethernet Gateway . 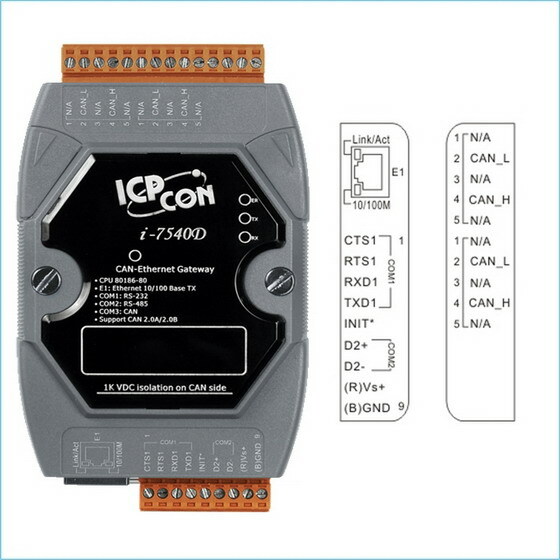 I-7540D can also be used as an Ethernet to CAN/RS-232/485 Device Server. The Device Server is an appliance that makes any device network enabled with a serial communication port. By virtue of its independent operating system, protocol independence, small size and flexibility, Device servers are able to meet the demand of virtually any network-enabled application. Most devices don't have network ports - I-7540D allows those devices to become connected to the network. 2500Vrms photo-isolation protection on CAN side. Support both CAN specification 2.0A and 2.0B. 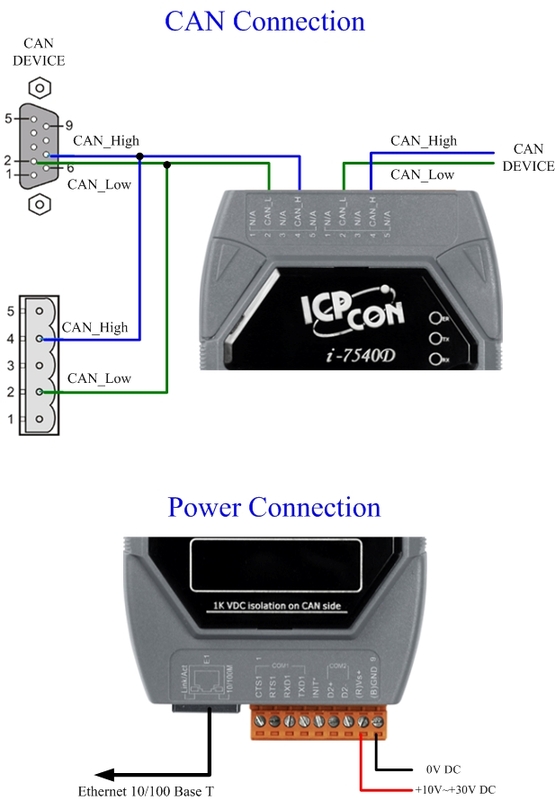 There are various communication interfaces among the CAN devices like PCI CAN board, Ethernet series, and RS-232 series CAN module. According to the different purposes of users’ projects, the users might need to choose different CAN products. Because of this situation, the programmer should develop different communication programs to handle different CAN devices. For example, the user could develop a “Socket Client” to communicate with I-7540. When using the I-7530, the users need “UART” techniques to communicate. Nowadays, ICP DAS develops the Virtual CAN technique. The Virtual CAN driver is an excellent tool for users. 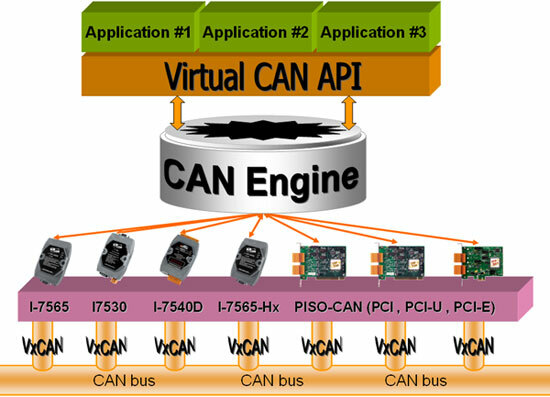 It transforms whole CAN devices into Virtual CAN ports. Then it generates Virtual CAN ports like “VxCAN 1” or “VxCAN 2”. The users could then send and receive CAN message by appointing a Virtual CAN port number. The users don't need to figure out what kind of CAN device is used. The test is the performance which transfer 8 bytes data frame from CAN to Ethernet (one TCP client). The test is the performance which transfer 8 bytes data frame from Ethernet (one TCP client) to CAN.